We’re slowly inching our way towards better documentation of Phish’s history. In this show, we actually get to hear two full sets from the band on a typical Wednesday night at Hunt’s. We also get to hear the variety that Trey talks about in the quote I posted in the 12/1/84 review. Also, important to note is that this is the first show where Paul Languedoc is the band’s sound man. This would prove to be extremely important as Paul also built Trey’s guitars and some of Mike’s guitars. That personal knowledge helped the band dial in their sound over these formative years and translate it to larger spaces over time. Languedoc would retire in 2004 and some would say he’s dearly missed. The show kicks off with a fun “Alumni Blues”. It’s interesting to hear it with out the “Jimmy Page” segue. “Makisupa” follows it up and stays with the new format but the same lyrics as 10/12/86. A new cover comes next and it’s very important to the history of the band. The song is “Skin It Back” by Little Feat. Little Feat would be important for its laid-back tai on Southern rock. Obviously a favorite of Mike Gordon, who sings lead, clearly the other members are also fans of their material. Little Feat might be the most unheralded influence of Phish but their impact is apparent in the band’s desire to make people dance. Little Feat has also appeared as the backing band on Robert Palmer’s “Sneakin’ Sally”, already a Phish staple. Little Feat’s mix of Rock and R&B, with some New Orleans influences made it clear choice to help bar patrons dance. The groove here is good if not “out there”. The band goes into Talking Heads’ “Cities” but without a smooth transition. Anything to keep people moving though. “Skin It Back->Cities” would be solidly in the rotation for the next 6 months. Another original debut “I Am Hydrogen” follows. “Hydrogren” has always been a very overlooked tune in my opinion. The beauty of Trey and Page playing together on this delicate riff makes my day and I’m a little sad when it’s not between “Mike’s” and “Weekapaug Groove”. Sitting by itself though, it gets the appropriate time to shine as a nice breather for the crowd. “McGrupp” follows and gets a bit of a re-do as someone matches Trey’s lyrics with a high-pitched voice. The spoken word is still here but a little less hard as in previous versions and also no Bob Dylan style vocal. More Gamehendge comes down the pike as “AC/DC Bag” follows. It returns with a short version of the 4/1/86 intro. This version’s interesting because Trey does his best lounge singer impression for some reason, dragging out the vowels, almost as if he was Richard Cheese covering Phish. “You Enjoy Myself” follows and it’s the best version the band has played so far. The intro is very clean. Page’s keys are starting to hit their marks. Still no drum and bass section at this point. The set ends with the debut of “Lushington”, meaning 10/15/86 will always have a place in PhanArt Pete’s heart. The chord progression is actually quite beautiful and very danceable. The lyrics however are quid awful about all the things a guy finds in this orifices. The middle section would actually end up being part of “Fluff’s Travels” and the longer suite of “Fluffhead”. So we can at least thank “Lushington” for that part of the opus. I stand with Pete Mason that I too would like to see a Lushington bust-out. It’s time. Maybe even some new, not so gross, lyrics. Set 2 kicks off with the introduction of Paul on the soundboard form Trey and then another important cover. Trey and Fish have long been acolytes of Frank Zappa and only Phish would be a bar band with the hutzpah to cover a Zappa tune. This one’s fairly straight forward in the strict composition “Peaches en Regalia”. The tune would come and go but it’d be an important part of their repertoire for years. “Golgi Apparatus” gets a little funky intro next. It’s pretty standard but Page’s synth at the end gets weird. I like it. We get a nice little jazz interlude to the tune of “Swing Low, Sweet Chariot”. It’s a nice break that shows off the jazz chops. Jazz is creeping in slowly to the band with the addition of Page and it suits the band well. 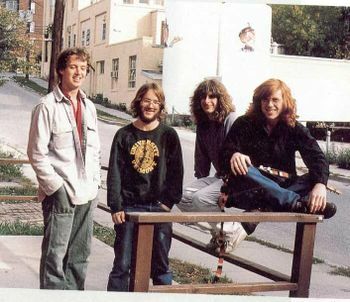 I think the addition of jazz influences is what made Phish stand out to me personally and really helped them stand out amongst other Burlington bar bands. It’s important to know that side of the band especially later on. However, we are in a bar so that dancing must continue, so of course we go down to the disco again with “Camel Walk”. Of course, this is the first “Camel Walk” without Jeff. Trey takes over lead vocals and Page gets a bigger piano part, or at least one that can be heard more clearly. Trey gets weird on the vocal, which is fun. They also let the tune breathe a lot more than when Jeff would play it. It still does not yet have the “Strut Your Stuff” sung in the round. Another cover debut happens with “Shaggy Dog”, a changed cover of “Shaggy Dad” by Lightnin’ Hopkins. It’s an interesting choice because while the blues-influenced rock of the Grateful Dead and the Allman Brothers have been introduced, this is the first time a track from the generation that influences those bands is brought forward. I’d love to know which band member brought this tune up at band practice. It also has tinges of the bluegrass sound that Phish would add more and more in the future. Trey’s solo on “Shaggy” is quite beautiful here. The band slides back into bar band mode busting out a cover of Wilson Pickett’s “Mustang Sally”. It’s a fairly standard version for Phish, which means they destroy the cover and play it better than 95% of the bands out there. After playing bar band, the band heads back to their own material with “Fluffhead”, which hadn’t been played since 12/1/84! Now without the Dude of Life on vocals and adding Page’s keyboard, the tune begins to take the now familiar shape. It’s a beautiful early version. Having played some Little Feat earlier, why not continue the trend? Getting the crowd moving with “Sneakin’ Sally as usual and it’s in fine form. “Wilson” follows next and the recording comes in in the middle. The song’s still not “there” yet. Very tame. Same goes for the following “Slave to the Traffic Light”, it’s close but missing something. The ending feels rushed and doesn’t have the patience needed to push it over the top. “Quinn the Eskimo” follows and about the 7 minute mark, it does get a cool little jam at the end but is a pretty standard version. That cool little jam also has a nice segue into “Mike’s Song”. This “Mike’s” gets quickly into the jam and it’s an early beast. It’s really the first time all night that all four guys are hitting on all cylinders. The trademark tension and release is poking its head out and I like what I see. Remnants of the odd ending remain but no lyrics for now. After heating it up, Phish cools things down with “Have Mercy”. Keeping the reggae theme, “Mercy” jaggedly goes into “Harry Hood”. This is the first “Hood” where Page gets to shine and he hits it out of the park. Where as “Slave” doesn’t quite have the power yet, “Hood” is the major player here. Trey’s phrasing is fast yet eloquent as he nails the peak and the band moves quickly behind him. It’s in that bliss the song evokes so often. Set 3 (!) opens with “Roll Like A Cantaloupe”. Some of you might say, “Wait. That seems very close to ‘Run Like an Antelope'” and you’d be right. It is “Antelope” with different lyrics. Played on 4 times, it has instructions for the next time you’re in the supermarket that sound rather cultish. It’s a good laugh though and worth a listen. The craziness continues as the band introduces “Sanity”. Not introduced in anyway like later versions. A wild ditty about losing one’s mind (not just a clever title), this version does not have the trademark riff that would be later added but still is a reminder of how fun Phish can be. What happens when you lose your “Sanity”? You get “Anarchy” and that closes the set despite some yelling for more. The rest of set 3 appears to be missing but always a pleasure to get any and all early Phish. For the encore, the band decides to debut an original called “Clod”. We get some fun banter in that Mike now has a kazoo and plays it for everyone. Trey tries to bring the mode down but saying “OK, this is serious now” with Mike following up, “On the heavier side” and the tune begins. “Clod” can be recognized as the nonsensical lyric section in the middle of “Fluff’s Travels” and later “Fluffhead”. It is also the part where Mike goes “Check it out” and “Check this out”. It is cool to hear on it’s own but make much more sense in “Fluffhead”. “Clod” however does show off the band’s newly forming jazz chops in a way that also shows off their ability to write their own take on the form. Just another way the early bar shows really do illustrate the band’s history and drive for success on their own terms.